MIM: From the Fuhrer to Florida :The Muslim World Congress aka Motamar -Al- Islami was started in Jerusalem by Mohammed Aminul Al Husseini ( aka The Grand Mufti of Jerusalem) in 1931. Husseini was allied with Adolph Hitler during the war, and tried to implement the Final Solution in the Middle East. He became head of the Muslim Brotherohood in the 1940's and mentored Yasser Arafat which resulted in the creation of the PLO. The General Secretary of the Muslim World Congress aka World Muslim Congress is Professor Hamid Al Rafaie, who also runs the International Islamic Forum for Dialouge. The Muslim World Congress has an office in Coral Gables, Florida under the heading of "Permanent Representative to the United Nations. The director is Malik Sardar Khan. According to Florida records Khan is involved with numerous organisations in Florida, which list Saudi nationals and princes as their directors . "...In 1941, Haj Amin al-Husseini fled to Germany and met with Adolf Hitler, Heinrich Himmler, Joachim Von Ribbentrop and other Nazi leaders. He wanted to persuade them to extend the Nazis' anti-Jewish program to the Arab world. The PLO and notably Arafat himself do not make a secret of their source of inspiration. The Grand Mufti el-Husseini is venerated as a hero by the PLO. It should be noted, that the PLO's top figure in east Jerusalem today, Faisal Husseini, is the grandson to the Führer's Mufti. Arafat also considers the Grand Mufti a respected educator and leader, and in 1985 declared it an honor to follow in his footsteps. Little wonder. In 1951, a close relative of the Mufti named Rahman Abdul Rauf el-Qudwa el-Husseini matriculated to the University of Cairo. The student decided to conceal his true identity and enlisted as "Yasser Arafat." MIM: From the Fuhrer to Florida : The World Islamic Congress started by Mufti Husseini has opened an office in Coral Gables Florida . The MWC says they are the Permanent Representatives to the United Nations. MIM: One of the chief funders of the Muslim World Congress appears to be the organisation's General Secretary Hamid Al Rifaie from Saudi Arabia. Al Raifaie has made numerous trips to the United States. The list of groups in the United States whom Al Rifaie and the MWC are associated with includes The Arab American Anti Discrimination Committtee, The Interfaith Alliance, and the Center for Muslim Christian Relations at Georgetown University. Which also raises the distinct possiblility that they received funding from Al Rifaie as well. The body receives funds from Muslim countries, including Pakistan and Saudi Arabia, and organisations including Rabita al Islami. As its finance secretary, a business magnate who also operates a private university, was confined to bed for the last one week on account of being indisposed; therefore, he could not answer Kolachi's queries pertaining to Motamar's finances. Husseini, Amin al- , 1896?–1974, Arab political and religious leader. He was inveterately opposed to the creation of a Jewish state in Palestine, and, suspected of complicity in anti-Jewish riots in Jerusalem (1920), he fled to avoid punishment. He returned under an amnesty and was appointed Grand mufti of Jerusalem by the British in 1921. He fled (1937) to Lebanon after being arrested for provoking violence between Arabs and Jews. Just before World War II, Husseini moved on to Iraq. After the abortive pro-Axis Iraqi revolt of 1941, he was flown to Rome. Then, in Berlin, Husseini broadcast Nazi propaganda and helped recruit Arab supporters for the Germans. In 1946 the mufti, escaping from house arrest near Paris, arrived in Egypt, where he lived until the early 1960s, when he moved again to Lebanon. Also called Haj Amin al-Husseini, he retired from public life after serving as president of the 1962 World Islamic Congress, which he had founded in 1931.
International Islamic Council for Daw'a and Relife (IICDR) is a coordinate foundation , which includes more than one hundred Islamic NGO's and GO's all over the world , headquarters is in Cairo - Egypt . Presidency Staff Council consists of H.E Sheikh AL Azhar - President , H.E. Marshal AbdelRahman Sowar AL Dahap - Vice President, H.E.AL Sheikh Yousf AL Hegy - Vice President, H.E.Dr.Abdulah Salih AL Obeid , Vice President, H.E.Prof. Kamel AL Sharif, Secretary General , and Excellencies Presidents of Specialized Committee in the council among of them Dr.Abdullah Nasif (IICI) Mr.Abdulmalik AL Hamar, (IICHR) Dr.S.Abdien (IICW&CH) Hamid A. AL-Rifaie , President of (IIFD) . Goals of the Council : guiding the Islamic work and its activities, organizing the efforts of the Islamic Omah (nation) to be in service of the fair Islamic issues, and developing Islamic act to be on level of mission of the Islamic civilization which calls on ; assuring unity of the human family , achieving the acquaintance among people, and activating the divine values to achieve human dignity, security and justic in the earth according to will of ALmighty ALLAH. The Congress resolved that a permanent international Islamic organization be set up to promote solidarity and cooperation among the global Islamic community (Ummah). It assumed organizational shape in the second International Islamic Conference held in Baitul Maqdas (Jerusalem) in 1931. The constitution and rules and regulations of the Motamar Al-Alam Al-Islami were framed and approved in this conference held under the presidentship of Alhaj Aminul Hussaini, the Grand Mufti of Palestine. He was elected as a President of the Motamar; the two Vice-Presidents elected were Allama Dr. Mohammad Iqbal and Syed Alouba Pasha. After the birth of the Muslim-majority State of Pakistan on August 14, 1947, under the leadership of Quaid-e-Azam Mohammad Ali Jinnah, its first governor-general, eminent Signatories of the World of Islam began working for the revival of the Motamar Al-Alam Al-Islami. Its revival was achieved in a World Muslim Conference held in Karachi, the capital of Pakistan at that time, in February 1949, with a stirring inaugural address delivered by Mr. Liaquat Ali Khan, Pakistan's first Prime Minister. This was followed by a bigger conference of the Motamar held in Karachi in February 1951. This Conference gave a new form and shape to the Motamar Al-Alam Al-Islami, making Karachi the Headquarters of the Motamar, with Alhaj Aminul Hussaini, the Grand Mufti of Palestine, as its President and Dr. Insamullah Khan as its secretary-general. It set up a Constitution drafting committee. Its two separate sessions dealing with "the Women of Islam" and the "Youth of Islam" aroused immense interest in the World of Islam. The Motamar's 1951 Conference held in Karachi saw the seeding of many ideas of cooperation among the Muslim countries and people, which in the years that followed became realities. Notable among them were the proposals for establishing a World Muslim News Agency and an International Muslim Development Bank. Between 1951 and 1999, the Motamar's Conferences held in different parts of the Islamic World have contributed immensely to the arousing of a feeling of fraternal solidarity in the Muslim Ummah and the promotion of institutions for mutual cooperation in diverse fields, including political, economic, religious, educational, and cultural interests. Since its establishment in 1926, the Motamar Al-Alam Al-Islami has championed Muslim causes such as Palestine, Kashmir, the Filipino Muslims' struggle, freedom for Muslim people from European colonian rule, and the economic emancipation of the Muslim Ummah. The IIFD is run by a Saudi called who lists himself as the Assistant Secretary General of the Muslim World Congress. 1- AL-Azhar AL-Sharif- Cairo . 2- Muslim World League - Makkah AL-Mukaramah . 3- Muslim World Congress - Pakistan . 4- Common Islamic Conference of AL Quds (Jerusalem)Jordan . 5- World Assembly of Muslim Youth - AL Riyadh . 6- Islamic Abo AL-Nor Complex - Damascus . 7- Ministry of AL Aogaf and Islamic Affairs -Egypt . 8- Ministry of AL Aogaf & Islamic Affairs- Morocco . 9- Indonesian Supreme Council for Islamic Daw'a - Jakarta . 10- Islamic Wagaf Foundation for Education & Guidance - Nigeria . 11- Islamic Union of the Student Organization - Turky . 12- Jordanian Hashemic Foundation for Charity - Jordan . 13- Islamic Union of North America -USA . 14- Dar AL Fatwah - Lebanon . 15- World Islamic Council - London . 16- Union of the Islamic Organization - France . 17- Ministry of Islamic Affairs & AL Aogaf -UAE . 18- Ministry of Islamic Affairs & AL Aogaf - Qatar . 19- Organization of Islamic Daw'a - Sudan . 20- Ministry of islamic Affairs & AL Aogaf - Kuwait . 21- Open American University - USA . 22- Union of the Islamic Organization - Europe . The website for the Islamic Forum for Dialouge cannot be assessed by url's - all of the information has to be assessed via the sidebar on the homepage: Note the reference to nearly 800 million dollars for the Al Aqsa and Intifada Fund. International Islamic Forum for Dialogue, organised by the Muslim World Congress, Jeddah, Saudi Arabia. The World Muslim Congress and the Islamic International Forum for Dialouge are connected. The director general of the International Forum for Dialouge is Mujahid Al Rifaie . MIM: Note that above Al Rifaie spouts rhetoric about "universality" and "human communities" and issues a declaration in which he proudly announces that the Arab Summit declared to stop opening relations with Israel and lauded the allotment of $800 million dollars to the Al Aqsa Fund (which is a code term for Arab terrorist groups like Hamas and Islamic Jihad ) in order to "perserve (sic) the Arabs identity of Jerusalem ( in other words -drive the Jews out). Rifaie reports that another $200 million will be given to the 'Jerusalam Intifade fund " to assist the families of martyr and their children..."
"...The Arab Summit came out with a final declaration in which they stressed their commitment to firmly challenge Israeli attempt to infiltrate the Arab world , in any form , and from now on , to stop opening relations with Israel . Whereas we appreciate the creation by the Summit of two funds , first the "Al Aqsa Fund" worth $800 million to preserve Arabs identity of Jerusalem , the second $200 million "Jerusalem Intifada Fund" to assist the families of martyrs and education of their children ..."
Whereas the tragic events of the past few weeks have exposed to the maximum the fragility of one sided and unjust calm which was termed as a peace process. The massacre and butchery of innocent Palestinians are a painful reminder of the absence of a collective response from the Arab and Muslim states which has became a source of encouragement to Israel and its supporters . It not only brings flash back of the last fifty tow years of a continuing tragedy but also a curtain raiser of what lies ahead in that region for the people of Palestine as well the countries of that region and beyond , who refuse to accept the hegemony of the Zionist entity . Whereas we appreciate the meeting of the Foreign Ministers of Arab League and then the Arab League Summit but went to a large extend in raising their voice against the continuing genocide which up-to-date has taken away 150 innocent lives of protection less Palestinians against brutal war machinery used by consciousness and cruel Israelis . Whereas the role of UN Security Council was totally marginalized . it was only the General Assembly which passed a resolution condemning the use of the brutal force against the innocent Palestinians . The Arab Summit came out with a final declaration in which they stressed their commitment to firmly challenge Israeli attempt to infiltrate the Arab world , in any form , and from now on , to stop opening relations with Israel . Whereas we appreciate the creation by the Summit of two funds , first the "Al Aqsa Fund" worth $800 million to preserve Arabs identity of Jerusalem , the second $200 million "Jerusalem Intifada Fund" to assist the families of martyrs and education of their children . Saudi Arabia decided to contribute the quarter of these two funds . The Arab leaders also decided to open Arab markets for Palestinian goods and exempted them from taxes and duties . The Ex-Council demands from the Security Council to from an 'International Criminal Court' to try Israeli war criminals who have carried out massacres against the Palestinians and Arabs in the occupied territories . The Council also demands from the UN Security Council and General Assembly to take responsibility for granting necessary protection of the Palestinian people under Israeli occupation by the establishment of an international force . They also demanded establishment of an impartial International Committee of Investigation on the reasons and responsibility for the dangerous deterioration of the situation in the occupied Palestinian territories . The Council declares that peace will not be achieved in this region without returning Jerusalem to complete Palestinian sovereignty and giving the Palestinian people their legitimate rights including the right to establish an independent State with Jerusalem as its capital . They Council calls upon the OIC states not to resume any official or unofficial activities within the multilateral frame - work and also to stop all steps and activities of regional economic cooperation with Israel within its frame - work . The Council also demanded the return of Palestinian refugees to their homes and lands in Palestine and for the expulsion of immigrant Jews brought to Palestine . The Council demands from the OIC member states to review their relations with terrorist state of Israel till a just settlement of the Palestinian sovereign state . 2- Ph.D. in Organic Chemistry – AL – Cairo University – EGYPT. 3- M.S. in industrial Organic Chemistry – AL – Azhar University – EGYPT – and Surry University – UK. 4- B. Sc. In Chemistry and geology Damascus – SYRIA. 1- Prof. In Chemistry at K.A Aziez University. 2- President of International Islamic Forum for Dialogue (IIFD). 3- Assistant Secretary-General, Muslim World Congress. 4- Member of Presidency of International Islamic Council for Da'wah and Relief. 5- Member of Coordinating Committee of the Islamic Da'wah Acts in the Organization of the Islamic Conference (OIC). 6- Expert of the Strategic Studies in OIC. 7- Member of the International Foundation of the scientific Miracle in the Holy Quran and Sunna. 8- Shared Secretary-General of the Islamic-Catholic Liaison Committee (Vatican). 9- Member of the International Islamic Charitable Foundation. 10- Member in many International Islamic Foundation in the World. 11- Vice-President of International Islamic Committee for Information (IICI). Number of Searches In the Chemistry. The Islamic Omaha. And Crisis of the Civilization Resuming. Islam and the Political Diversity. Al- Muslims and the West. Politeness of the Dialogue and Controversy in Islam. Islam and the complementary of the Civilizations. Islam and the New World Order. We. And the Dialogue of the Civilization. Islam. And the Culture of the Dialogue. Islam. And the Human Rights and Duties. Islam. And the Rights and Duties of Citizen. Islam. And the World Treaties. Islam. And the Human Security. Islam. And the Human Coexistence. Islam. And the Unity of the Human Family. Islam. And the Lionize of the Woman. Islam. And the Strive Against the Poverty. 1. Common Symposium With Council of Medial East Churches Cairo – Egypt, October 10, 1998. 2. Common Symposium With the American National Council of Churches of Christ. USA. Cairo- Egypt, 11 October,1998. 3. The fourth section of Islamic-Catholic Liaison Committee, Cairo-Egypt, 17-18 July, 1998. 4. Common declaration of Islamic-Catholic Liaison on the tragedy situations in Kosofa, 9/ 4/1999. 5. The fifth section Islamic –catholic Liaison Committee, in Paris – France 1-3 July,1999. 6. Conference on Islam and human rights in Room- Italy, 1999. 7. Conference of religion and peace in Amman – Gordon, 25 – 29 / 11/ 1999. 8. The sixth section of Islamic Catholic Liaison Committee, In Cairo – Egypt, 4 5 July, 2000. 9. Millennium Summit of Religious Leaders in Rome – VATICAN, 1999. 10. Millennium Summit of Religious and Spiritual, Leaders in UN, 28 - 30August, 2000. 11. The ninth section of the Islamic Summit In Doha – Qatar, 12 – 15 August, 2000. 12. The extraordinary section of Islamic –Catholic Liaison Committee for consultation and estimating action of committee, in Vatican, 21 – 22 February, 2001. 13. Common declaration delivered by Islamic Catholic Liaison Committee on 12 September, 2001. Regarding of 11 September bumping in New York. 14. Letter to Mr. George W. Bush, President of USA, on September 13, 2001, regarding 11 September events in New York. 15. World declaration issued by NGOs on September 18, 2001.Regarding September 11, bombing in New York. 16. International Conference on Religions Cooperation – in Taipei – Taiwan. 18-21st September 2001. 17. Signing Common agreement for annual dialogue with the World, Buddhist, Chinas association, Taipei – Taiwan, on September 19, 2001. 18. The International Symposium for Dialogue – Cairo – Egypt, on 28 – 29 October, 2001. 19. Symposium of the Arabic Team for Islamic – Christian dialogue and Council of the Middle East Churches, in Cairo 18 – 20 December 2001, regarding September 11, Events in New York. 20. World Symposium on September 11, events in New York, in Kuwait, on December 22 –24, 2001. 21. A common letter signed by each of Dr. Abdulah nasif, Mr. Kamel Alsharif, alshikh Abdulah Bin Bia,a and Dr. Hamid Bin Ahmad AL-Rifaie, on December 31, 2001. Regarding cooperation for putting an end of the disorder case in the world. 22. The Seventh Meeting of the Islamic - Catholic Liaison Committee, in Vatican City 3 - 4 July 2001. 23. A common commitment for the World Peace, in the Assisi city – Italy, on January 24, 2002. 24. The World Economic Forum - New York – USA, from January 28 to 4 February – 2002. 25. Meeting with the American, National, Churches Council of Christ Churches in New York, on February 4, 2002. 26. Meeting of Council of Islamic – American relations in New York, on February 4, 2002. 27. Meeting with Council of the National Cathedral in Washington, on February 5, 2002. 28. Meeting of William Penn House in Washington, on February 5, 2002. 29. Meeting with Arabic – American Anti- Discrimination Committee, in Washington, on February 5, 2002. 30. Meeting with Inter –faith Alliance in Washington, on February 6, 2002. 31. Meeting with Center for Muslim – Christian Understanding in George Town University – Washington, on February 6, 2002. 32. Meeting with Theological Consortium, Dominican House in Washington, on February 6, 2002. 33. Meeting with the Interfaith Conference of Metropolitan for Dialogue in Washington, on February 7, 2002. 34. Meeting with Becket Fund of Religious Freedom in Washington, on February 7, 2002. 35. The 29th session of the Conference of the Minister of Foreign Affairs of Islamic Countries to be held in Khartoum, Sudan - 25 – 27 May 2002. 36. A common declaration issued by Islamic – Catholic Liaison Committee on April 14, 2002. Regarding the tragedy situations in Palestine. 37. World symposium on Islam and Dialogue among Civilizations, Riyadh – K.S.A. On May12 – 17, 2002. 38. The 8th session of Islamic – Catholic Liaison Committee Safar 2- 3, 1423 h According to July 12 – 13, 2002 UK. 39. IARF World Congress - 28th July 2002 – 2nd August 2002.Budapest – Hungarian. 40. Lecture on Islam and Dialogue of Civilizations Presented by President of ( IIFD ), in Millennium Auditorium – TULIP INN HOTEL, Budapest on August 7, 2002. 41. Summit of World Islamic Leaders for World Peace in London – KU, on August 3 –5, 2002.Organized by ( International Federation of Religions for World Peace- New York ). 42. World summit on the sustainable development – Johannesburg / South Africa, from August, 26 to – September 4, 2002. 43. The International Consultation on Christians and Muslims in Dialogue and Beyond in Geneva- Switzerland - October 16 – 18, 2002. 44. World Forum for Social Development, UN, New York, from October 16 – 17, 2002. 45. Conference of Islamic – Christianity Dialogue – in Al - Manama – Kingdom of Bahrain - 28 – 30 / 10 / 2002. 46. A joint letter to each of President Bush, President Sadam, and Primer Tony Blear, on February 15,2003. Regarding of preventing war against Iraq, singed by President of IIFD – World Muslim Congress and President of PCID-Vatican. 47. International consultation on ( Beyond Co-Existence Toward a new Culture of Peace; Focusing on the Middle East ) – Washington D.C. February 27th to March 2nd, 2003. 48. Conference of Religion and Peace, Amman – Jordan, on May 27-28, 2003. 49. First Mediterranean congress on the new Israeli-Palestinian project: Seed- bed of a culture of Peace / Switzerland-Geneva -22nd – 26th June 2003. 50. Dialogue with the American delegation presided by H.E. Mr. Lorne Craner, asst. sec. Department for democracy affairs Mr. Kolen Paul, in the presence of H.E. Mr. Robert Jordan Ambassador of USA in Riyadh, on July 21, 2003. In Jeddah – KSA. 51. International Symposium of Dialogue among Civilizations, Riyadh – KSA, from March 17 - 20, 2003. 52. Dialogue with Mr. David Abramson, Director of International Committee for Religious Freedom in Foreign Affairs Department of USA, attending by Mr. Trey Leuns, Asst. of American General Consul for Politic and Economic Affairs – Jeddah, on September9, 2003. 53. World Public Forum " Dialogue of Civilizations ‘' September 3 – 6, 2003 - Rhodes, Greece. 54. Signing agreement for annual dialogue with Center of Russia National Glory, Mosque- Russia, on September 6, 2003. 55. Dialogue with Foreign Affairs Committee in the Canadian Parliament, in Riyadh- residence of Canadian Ambassador, on October 22, 2003. 56. International Conference on Human Rights in Peace and War, In Riyadh – KSA, from October 14 – 15, 2003. 57. International Conference on Islam and West, in Khartoum – Republic of Sudan, from December 13 –15, 2003. 58. Meeting of conciliation among religions in Vatican City In presence of pope, on January 17, 2004. 59. The ninth section of the Islamic Catholic Liaison Committee, on January 19 – 20, 2004. Vatican – Rome. 60. Pope receiving Islamic – Catholic delegate and exchanges speeches with both Heads of delegates, on January 20, 2004. 61. The seven symposium of recent of Islamic Thought, in Kuwait, on February 20 – 22, 2004. 62. Letter to George W. Bush, President of USA, from President of IIFD on March 25, 2004. On his speech on the occasion of a year after war in Iraq. 63. President of IIFD address 60th Session of the Commission on Human Rights in Un, March - April 2004 SWISS – GENEVE. 64. The 3rd World Meeting of Religions and Cultures for a New World Cultural Contract, Athens – Greece , May7-9, 2004. 65. Islamic Christian Conference on Building Dialogue for Building Peace, Assisi – Italy, on September 17 – 18, 2004. 66. Quarter Conference for Islamic Christian Dialogue, on topic of Religious Freedom, on May 27 – 29, 2004. Doha – Quarter. May peace be upon you, the friendly people of America and all people are everywhere. You may be well aware that on February 15, 2003 my colleague Archbishop Michael Fitzgerald, President of the Pontifical Council for Inter-religious Dialogue in the Vatican and myself sent a joint letter to Your Excellency, regarding the Iraqi issue. Then I also sent another letter to Your Excellency regarding the same issue on March 04, 2003. Recently, I read with great interest your venerable address that was published in ( the International Herald Tribune on Saturday-Sunday, March 20-21, 2004 ); on the occasion of one year after the start of the war in Iraq ( please find attached a copy of it ). · " …We will never bow to the violence of a few "
· " …We will face this mortal danger, and we will overcome it together "
· " …It is the interest of every country and the duty of every government to fight and destroy this threat "
· " … There is a dividing line in our world, not between nations, and not between religions or cultures …"
· " … But a dividing line separating two visions of justice and the value of life". The reason of my hesitation regarding this expression is the following: As Your Excellency knows justice and life are two divine values and there is no religious, cultural and political controversy in the world regarding their sacredness. Hence, I do not see any interest in indicating or confessing that there are two different visions regarding justice and life in the world. This is important with a view to prevent a few terrorists to interpret this expression in favour of their mortal approaches when they say: "…that the war today is decided between two camps. A camp of Good and a camp of Evil " I hope that Your Excellency would kindly clarify this expression which may open the way to dangerous interpretations. On the other hand - as Your Excellency knows – the world is living today a general case of anger due to the expansion of injustice among human communities. This anger is expressed in different forms of violence and extremism everywhere. Therefore is a need for an urgent and strategic vision, as well as serious collective efforts to resolve all cases of international injustice and to establish the values of justice among human communities. One of the motivations that incites me to write this letter to You is the overwhelming desire of the International Islamic Forum for Dialogue to contribute with the world's wise leaders in crystallizing a world charter of values, tackling the case of injustice in the world, establishing deep rooted standards of justice among communities and founding the culture of peace among human generations. Also, one of the reasons that encourages us in going on this direction is the positive meeting held in Jeddah on the 21st of July 2003 with H. E. Mr. Lorne Craner, Assistant U.S Secretary of State , H. E. Mr. Robort Jordan, U.S. Ambassador in Riyadh at that time, H. E. Ms. Gina Abercrombie, U.S. Consul General in Jeddah and the attendant delegation. Truly, we felt that both sides share a big common ground that motivates us to continue our consultation and cooperation in order to achieve the best of our peoples and the safe coexistence among the international communities. Mr. President .. One Moment Please! May peace be upon you, the friendly people of America and all people every where, I send this greeting from a worried heart by atmospheres loaded with horror owing to presages of a destructive conflagration, the beginning of which may all witness; but moment of death may not enable some of us to live it's catastrophes and witness extending of it's tragedies. You may be well aware that aftermath of the painful disaster of September eleventh, and to be more precise, on September 15, 2001, my colleagues Dr. Abdullah Nasif, Mr. Kamil Alsharif and Al-shaiekh Abdullah bin Biah and I immediately sent a joint message to your Excellency in the name of the World Muslim Congress and the International Islamic Forum for Dialogue. The message was expressive of our deep grief and sincere condolence both to your good -self and to the bereaved families, and clarified our vision regarding the event and what is to be done to put an end to the deterioration of security in the world. We received your esteemed reply on December 4, 2001,wherein you welcomed the idea of cooperation to confront the world disorder. On December 31, 2001, we sent our approval, and we have been anticipating your Excellency's long awaited response ever since. At the end of 12th session of the executive council of World Muslim Congress, which was held in Colombo – Sri Lanka from 18 to 19 December 2002, we addressed an open letter to all the world Leaders wherein we stressed on the fact that ‘ Justice ` is the safest as well as the shortest way to the world Peace. Two weeks ago, and precisely on February 15, 2003, my colleague Archbishop Michael Fitzgerald, President of the Pontifical Council for Inter-religious Dialogue in the Vatican and I sent a joint message to your Excellency as well as to both President Saddam and Prime Minister Tony Blair, wherein we expressed our common stand towards the Iraqi crisis, and demanded that each one of you to exert serious and sincere efforts to abandon the war option, and instead, adopt dialogue and peaceful means through the UN to achieve what we all aspire to for, such as eradication of the culture of terrorism and terrorists wherever they may be, and cleansing the Earth of weapons of mass destruction wherever they may be found without distinction, and last, but not least insuring Justice, Peace, Prosperity and safe co-existence among mankind at large. Very recently, as you may well be aware of, an International conference was held in Washington DC, and precisely, from February 27 to 2nd March, 2003, attended by representatives from UN, and U.S. government, in addition to political and religious leaders from all over the world, to discuss how to activate the peace process in the Middle East, and establishing culture of the peace and safe co-existence between human societies. In my speech I delivered on behalf of the International Islamic Forum for Dialogue, I stressed upon the fact that establishing and respecting the principles of Justice, commitment to its criteria, institutionalizing the culture of dialogue and safe co-existence among the human communities, as well as abandoning culture of clash between civilizations and getting rid of the war option must all be our common path as well as the must favored option in our life. Perhaps one may have the feeling he is going through those difficult hours that precede the explosion of the option of war and destruction, it is incumbent upon good and peace-loving people to continue seeking towards peace, and way is not, it may be the golden goal is achieved at the last moment, and then the originality of good and nature of mankind get victory, as well as the justifications of war and its disasters fall in front of the will of peace and its virtues. In view of the foregoing, and aspiring to give priority to the peace option even at the last minutes, allow me to say: " Mr. President! One Moment Please "
At this final moments, please allow me to narrate a symbolic story from our expressive Arabic stories. The story is about a state, which is may similar to the prestige of the United States of America today among nations. The story says: that the inhabitants of a small village were afflicted with a wild bull attacking their village from time to time, kills the inhabitance, destroy their simple homes and fills their hears with horror, while they under this state terror, Antara, ( the famous hero in the Arabic history) passed by the village, the inhabitance were very happy to see Antara among them because he will save them from the bull, and when they narrated theirs problem with the wild bull, Antara asked them: What do you do when the bull attacks your village? We run off to the mountaintop and remain there until the bull leaves, they said, and while they debate the state with Antara. Suddenly, the bull came in roaring like thunder. As usual, the villagers fled to the mountain, Antara looked black at the bull and pullout his sword to put an end to this fearful bull and to make people of the village live in peace. But suddenly, Antara changed his mind and sheathed his sword and followed the villagers to the mountain. When he joined them, they wonderfully, asked him: why easily, you drew back against the bull? Why you violated your promise to free us from the bull? Antara said to them calmly and wisely: My friend please listen to me, at the last moments I thought deeply, then I found out that the fighting with the bull will only place me before two probabilities: If I defeated and killed the bull, people will mock at me and say: Antara, the famous hero has killed a bull; and if the bull due to any reason defeated and killed me, that will be a an enormous disgrace belies all my heroic deeds and fame, and will destroy my prestige between people. So, at the last moment, I took my difficult decision not to enter fighting with the bull and joined you. However, this does not mean I have gone back on my promise to help you get rid of the bull and its crimes, but that will be in a different way and through means which are suitable for the bull and its plans, and explained to them his scheme and promise them that he will continue in exert his advice and support. Convinced, the villagers decided to follow Antara,s plan, and by so doing the overcome the bull, the most serious crisis that ever faces their life. Rank of Antara raised between the villagers, people everywhere are talking about sagacity of Antara's mind. Assuring that the heroic deeds of Antara in the fields of view and advice are superior to his heroic deeds when he comes to using the sword and fighting. There may be similar symbolic stories in the American culture accordance to this symbolic story and its significance. However, I have no doubt that your history tells you as it tell us of expressive stories about the wisdom exercised by the great men of your country in taking similar last minute difficult decision regarding similar crisis. Therefore, on behalf of the International Islamic Forum for Dialogue, World Muslim Congress and all peace loving people, I would like to advice Your Excellency and invite you to enter into history through its widest and most noble doors, by taking a wise and courageous decision from the position of power, which you control today, to replace the war option with the peace option and its means through the United Nations. It is the best and the shortest way to realize people's goals and their aspirations towards safe and peaceful life. The Arab wise men say: Shaking the stick is better than using it. · We have to recognize that There are a real difference between Zionism and Judaism. · Zionism is a political and economic world movement; while Judaism is a fundamental religious movement. · Israel is a Zionistic project with Judaic Cap. · We think there is a hidden clashes between both Zionism and Judaism movements a bout the end shape of Israeli state. · Zionism wants it a secure state in side of the 1967 borders; with political and economic extension through out the Arabic region. While Judaism insists on geographical extension to achieve the great Israel according to the alleged instructions of torah. 1. The governmental position is allays with the Zionism strategy except some personal exceptions in side the congress and the Whitehouse administration. 2. The fundamental Christians and the so called the new Jewish – protestant movement, who strongly support the Judaism strategy. 3. Most American people is subjecting to the effect of the mass media. 4. Officially America considers Israel according to the Zionism theory the security and strategy option. · Why America selected Israel to be come her strategy option in heart of the Arabic region? · Why America has dropped the Arabic option in favor of the Israeli option? 1. Dos not form any threat against the American interests in present or in the future. 2. Has not factors of the auto – self-growth. 3. Arabic – Israeli clash has a deep roots; the thing which makes Israel in pressing need to American helps. 4. Balance of the Position strategy in the Arabic region. · Per-contra, the Arabic countries are a civilization competitor to US so, every one of the Arabic country is acceptable to be only a provisional strategy allay to America. While Israel is a lasting strategy allay. MIM: An excerpt from Hamid Al Rifaie's conspiracy theory laden ' Islam and the Dialouge of Civilisations in the Era of Globalisation' in which he rails about "sinking values and whoremongering legislations" which he blames on "envious agents of international Zionisism and scheming Masonic lodges". 1- Making abortion permissible under the pretext that it represents a means of development, as it results in fewer population and higher standard of living. 2- Letting sexual freedom absolutely loose among teenagers and children. 3- Recognizing the right of teenagers to private life of their own with secret information that must not be violated by the parents. 4- Aiding and abetting teenagers and children to respect previous rights enacted by governments and other institutions; and compelling parents to respect the rights of teenagers and children. Against this dangerous document, we further comment and raise our voices demanding and warning all reasonable and wise people of the world, regardless of their religion, race, people and nationality to organize an international forum under the theme of: "The Risk Against Culture". The purpose will be to discuss the perils facing contemporary human civilization, foremost and most deadly of which is the assault spiritual as well as religious values, transgression against values, race and family morals, breach of family ties, distorting the spiritual, moral and behavioural relations in the ties binding its individuals, the coherence of unit, living, social and cultural structures; the assault on the humanity of individuals, disfiguring and their values and innate standards, ruining the elements of modesty in their nature and exciting the instincts to the point that makes it take control of the individual's behaviour and morals, at the expense of reason, conscience and sense of responsibility. To discuss likewise, anything reaffirms the existing balance between the material and the spiritual aspects or the moral and the spiritual as well as the value oriented elements regarding the correctness of the track of human civilization. Both we, as Muslims and the reasonable people in the world would like to voice out our warning against the scornful currents hostile to spiritual as well as humane values, with vested interest in the deterioration of values and morals, as well as in the continued deterioration of culture and in instigating conflict and collusion among the cultures, so as to serve their scornful civil schemes represented in the values of the extremist secularist and destructive atheist currents, prominent among which are the remnants of the collapsed Marxism, envious agents of international Zionism and scheming Masonic lodges. Dialogue among civilizations became an international phenomenon and a pressing requirement . There are many sides in the world today , practicing the dialogue in aim to achieve a safe human co - existence and to avoid wars , disasters and crises . And addressing their traces on the security , societies , human dignity and safety of the environment . For that , International Islamic Council for Daw'a and Relief decided establishing of the International Islamic Forum for Dialogue (IIFD) to assume tasks of the dialogue and to ingrain it's conceptions . And Laying down the mechanisms and rules , and determine the suitable means to achieve the constructive goals of the dialogue . And to coordinate among the Islamic Organizations in the field of Dialogue . Organizing assemblies and conferences among those how interested in dialogue of the Islamic foundations in the world . 2- Participating in the international assemblies and conferences which is interested in dialogue , to achieve the goals of the Forum and serve the interests of the Islamic Omah (nation) . 3- Activating media and Knowing legal means to develop the culture of dialogue and it's Islamic aims . 4- Activating and developing the means of communication among the member organizations , to achieve the goals of coordination and to exchange the information expertise among them in the field of dialogue . 5- Forum membership is a right of every organization which is interested in dialogue in the frame of coordinating and according to the unit plan of the IICDF . 6- Every organization Practice dialogue must inform the member organizations through the Forum about the topic and the results of their dialogue , to distribute it . 7- The President of the Forum calls for the meetings by coordinating with the Secretary General of the council . 8- The President of the Forum is the official spokesman . 1- Intrducing Islam and it's international values and principls as a divine mission to guide the movment of mankind in life for the sake of his happiness in this world and in the hereafter . 2- Assuring unity of the human family , achieving the acquaintance among people for the sake of activating believable values as the basic source to secure the human dignity , and to achieve a safe human coexistence according to will of Almighty ALLAH . 3- working to find cooperation among the people and to resist all reasons of the family disintegration and social decadence . 4- Assuring the importance of reservation of the safety of the environment and working to resist all reasons of corruption and pollution, for sake of keeping the earth as a safe dwelling house for all . Q2- Why is dialogue confined to Christians and excludes the Jews? Firstly: In princbiple, dialoghue is held between poarties who are prepared to be committed to the dictates of values and principles, as well as be commite to standards of justhice, debate and proof. Secondly: The Internathional Idslamic Committee four Dialogue has notb restyricted its activities in the field of dialogue to a specfic religious or cultural body. We engage in dialogue with all regarding any lefgitimate issue intended to achieve the best for the human family, provided the other party is committerd to the methodology and standards of dialogue indicated in First above. Thirdly: Any party in the world that lacks commitment to the methodology, standards and values of dialogue and insists on showing disregard to divine standards and civilized norms automatically omits itself from the list of those we condfuct dialogue with. There is no dialogue with those who go against the least standards of respect for human dignity and the values of safe human co-existence. Within the previous context, the Jews, are regarded like the followers of any religion, cult, culture and civilization. We are prepared to conduct dialogue in every legitimat issue aimed at achieving the best for a safe and just human co-exitence with any party among them who shows commitment to the methods, values and standards of dialogue. This excludes those among them who resent the values of dialogue, and of course, such is the habit of most Jews, who insist today on pursuing the policies of conflict, violation of man's dignity and suppression of his rights and factors o-f his existence in order to achieve the vagaries and ambitions of international Zionism. Are they not the ones who are perpetrating the foolish violations and insolent defilation of the Al-Aqsa Mosque and other religious places in Al-Quds (Jerusalem)? Don't their rash, bloody and contentious massacre of children, women and old people with the blessing of the international Zionism and iniquitous world powers serve as a strong proof of their rebellion against, not only divine values and principles, but against all human standards and customs? In fact, this goes a long way to confirm the fact that there is only one dialogue language that the Jews understand and insist on adopting as a code of life, i. e. the language of rifles, rocket launchers and any means that could help them perpetrate tyranny and mischief in the land, and help them impose their influence on human societies not understand. Q3 – What is the optimal way of conducting Dialogue with the Secularists in the Islamic Countries? A3- In our understanding, dialogue has one optimal way for all, based on wisdom, good speech and commitment to legitimacy, objectivity and intellectualism in conducting dialogue with the other party. The secularists are but an intellectual group that has its own vision and belief in its dealing with the political as well as social issues of life. We in the International Islamic Committee for Dialogue hold dialogue with this group regarding any issue that is envisaged to realize the best for our community as well as for the entire human family, so long as there is commitment to the methodology, values and criteria of dialogue. 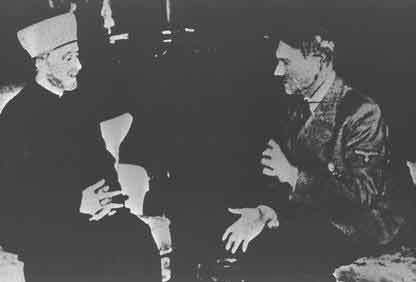 The appointment of the young al-Husseini as Mufti was a seminal event. Prior to his rise to power, there were active Arab factions supporting cooperative development of Palestine involving Arabs and Jews. But al-Husseini would have none of that; he was devoted to driving Jews out of Palestine, without compromise, even if it set back the Arabs 1000 years. Al-Husseini represented newly emerging proponents of militant, Palestinian Arab nationalism, a previously unknown concept. Once he was in power, he began a campaign of terror and intimidation against anyone opposed to his rule and policies. He killed Jews at every opportunity, but also eliminated Arabs who did not support his campaign of violence. Husseini was not willing to negotiate or make any kind of compromise for the sake of peace. Remember, Abbady, this was and will remain an Arab land. We do not mind you natives of the country, but those alien invaders, the Zionists, will be massacred to the last man. We want no progress, no prosperity. Nothing but the sword will decide the fate of this country. In 1929, major Arab riots were instigated against the Jews of Palestine. They began when al-Husseini falsely accused Jews of defiling and endangering local mosques, including al-Aqsa. The call went out to the Arab masses: "Izbah Al-Yahud!" — "Slaughter the Jews!" After the killing of Jews in Hebron, the Mufti disseminated photographs of slaughtered Jews with the claim that the dead were Arabs killed by Jews. In April, 1936 six prominent Arab leaders formed the Arab Higher Committee, with the Grand Mufti Haj Amin al-Husseini as head of the organization, joining forces to protest British support of Zionist progress in Palestine. In the same month, riots broke out in Jaffa commencing a three-year period of violence and civil strife in Palestine that is known as the Arab Revolt. The Arab Higher Committee led the campaign of terrorism against Jewish and British targets. Using the turmoil of the Arab Revolt as cover, al-Husseini consolidated his control over the Palestinian Arabs with a campaign of murder against Jews and non-compliant Arabs, the recruitment of armed militias, and the raising of funds from around the Muslim world using anti-Jewish propaganda. In 1937 the Grand Mufti expressed his solidarity with Germany, asking the Nazi Third Reich to oppose establishment of a Jewish state, stop Jewish immigration to Palestine, and provide arms to the Arab population. Following an assassination attempt on the British Inspector-General of the Palestine Police Force and the murder by Arab extremists of Jews and moderate Arabs, the Arab Higher Committee was declared illegal by the British. The Grand Mufti lost his office of President of the Supreme muslim Council, his membership on the Waqf committee, and was forced into exile in Syria in 1937. The British deported the Arab mayor of Jerusalem along with other members of the Arab Higher Committee. According to documentation from the Nuremberg and Eichmann trials, the Nazi Germany SS helped finance al-Husseini's efforts in the 1936-39 revolt in Palestine. Adolf Eichmann actually visited Palestine and met with al-Husseini at that time and subsequently maintained regular contact with him later in Berlin. ... to settle the question of Jewish elements in Palestine and other Arab countries in accordance with the national and racial interests of the Arabs and along the lines similar to those used to solve the Jewish question in Germany and Italy. With the collapse of Nazi Germany in 1945, the Mufti moved to Egypt where he was received as a national hero. After the war al-Husseini was indicted by Yugoslavia for war crimes, but escaped prosecution. The Mufti was never tried because the Allies were afraid of the storm in the Arab world if the hero of Arab nationalism was treated as a war criminal. From Egypt al-Husseini was among the sponsors of the 1948 war against the new State of Israel. Spurned by the Jordanian monarch, who gave the position of Grand Mufti of Jerusalem to someone else, Haj Amin al-Husseini arranged King Abdullah's assassination in 1951, while still living in exile in Egypt. King Tallal followed Abdullah as king of Jordan, and he refused to give permission to Amin al-Husseini to come into Jordanian Jerusalem. After one year, King Tallal was declared incompetent; the new King Hussein also refused to give al-Husseini permission to enter Jerusalem. King Hussein recognized that the former Grand Mufti would only stir up trouble and was a danger to peace in the region. Haj Amin al-Husseini eventually died in exile in 1974. He never returned to Jerusalem after his 1937 departure. His place as leader of the radical, nationalist Palestinian Arabs was taken by his nephew Mohammed Abdel-Raouf Arafat As Qudwa al-Hussaeini, better known as Yasser Arafat. In August 2002, Arafat gave an interview in which he referred to "our hero al-Husseini" as a symbol of Palestinian Arab resistance. 71 TURKI BIN ABDUL AZIZ ST.
515 S. BISCAYNE RIVER DR.